It's TGIF!! Thanks to BRAND’S® and Sample Store for introducing the new RubyCollagen Essence Drink. 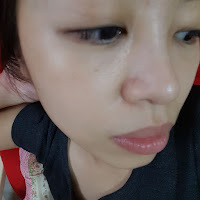 I got a total different experience trying the collagen. Operating across six major markets namely, Thailand, Taiwan, Singapore, Hong Kong, Malaysia and China, BRAND’S® is the market leader in Asia with over 80 per cent market share. The company-owned manufacturing plants located in Thailand, Taiwan, Malaysia and China ensures that products meet the highest quality and safety standards. Keeping relevant with consumers’ demands and changing needs is one of the company’s topmost priorities. Developed with a winning combination of scientifically proven health-enhancing ingredients, BRAND'S® InnerShine® is a modern range of beauty wellness supplements to help you promote beauty from within. Don’t let your lifestyle stand in the way of feeling great and looking fabulous. Let BRAND'S® InnerShine® bring out the best in you. For more information about BRAND’S®, you can visit www.brandsworld.com.sg. So there's more and more brands of collagen coming up. With that, one has to be unique in order to stand out. 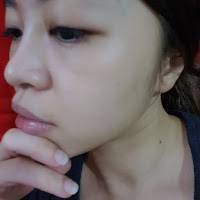 So what's so unique about RubyCollagen? Unlike normal collagen, RubySignature™ formula is created with a unique and precious blend of ingredients derived from natural sources. It contains micro-collagen and one of mother nature’s most powerful antioxidants, astaxanthin (micro-algae extract). 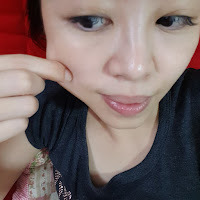 Scientifically proven, its anti-oxidant power is 6000 times more powerful than Vitamin C, 800 times more powerful than CoQ10 and 500 times more powerful than Vitamin E. Collagen is necessary to support the skin’s structural foundation to improve firmness and elasticity for youthful and supple skin. Astaxanthin serves as the perfect complement by acting as a natural shield against the collagen-depleting procedure. 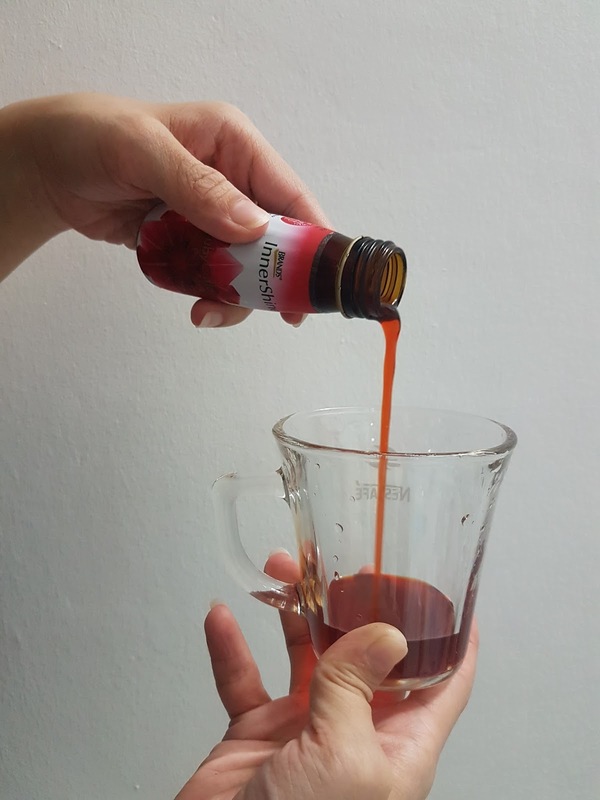 In containing both micro-collagen and astaxanthin, RubySignature™ formula defies the ageing process by performing a vital triple-action of supplying collagen, protecting against collagen degradation and delivering collagen effectively to skin cells. 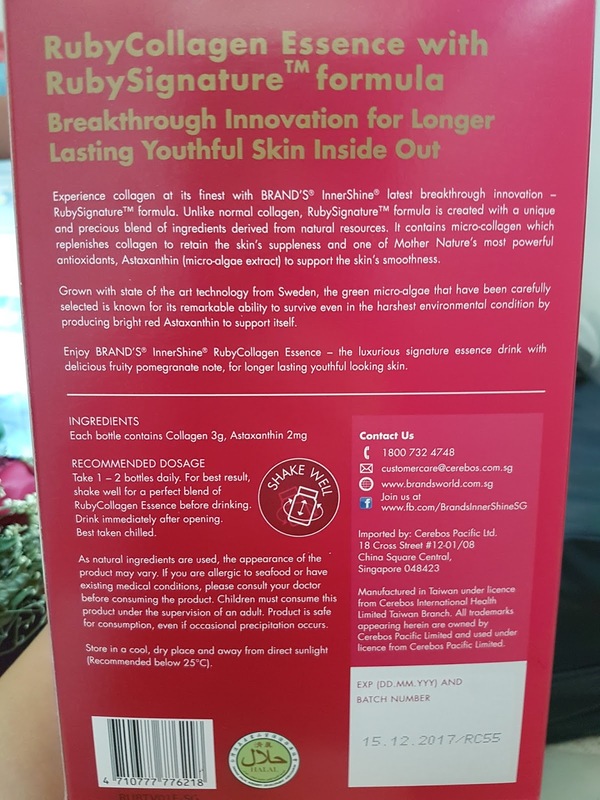 The main highlight and most powerful part of the collagen is this ingredient "Astaxanthin"
Astaxanthin is the most powerful antioxidant known to science. It helps to combat the risks of high blood pressure and heart disease by reducing "bad" cholesterol oxidation (Perfect for me as I have slight high cholesterol!). This prevents the build up of fatty deposits in blood vessels and helps maintain blood vessel elasticity, preventing premature ageing of the blood vessels. 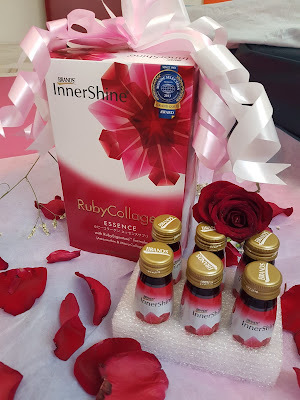 The RubyCollagen Essence range by BRAND’S® InnerShine® is available at all leading pharmacy and personal care stores. Disclaimer: Product was provided for personal review purposes only. All reviews are 100% honest and based on my personal experience. No monetary compensation of any kind was given or received for this review.